The start of a new series of a detective novels is exciting, even when they were originally published in 1926. Dean Street Press have started to reprint the books of Christopher Bush, and they sent me number one to review, for which many thanks. The detective in question is Ludovic Travers, referred to in this novel as Ludo, but in this opening mystery the focus is on Geoffrey Wrentham. Both men have served with some distinction in the First World War, and Wrentham has just been demobilised, which leaves him both relived to be returning to his home village, but a little bewildered by events which seem to threaten his own money. The adventure that he embarks on is full of excitement and a little danger, alongside painstaking working out of clues, with some village characters thrown in. 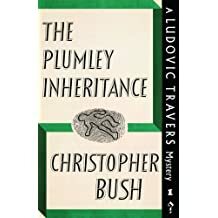 The mystery of the Plumley Inheritance is not easily solved, and keeps everyone guessing until the end. Henry Plumley is a man with many investments and interests. His sudden, public collapse and subsequent death leave instability in the businesses he has run, and questions about what his final motives implied to those dependent on them like Wrentham. Ludo is eager to help, having worked for the dead man on a peculiar list of requirements which has puzzled him for months. Trying to decode this list together with subsequent mysterious events occupies Wrentham for much of the novel, and his recent war experiences lead him to risk all searching at night time for further clues. There is a suspicious death and guilty goings on, but the ending seems satisfactory. The setting of a country vicarage and a village means a limitation to the number of suspects, though Plumley’s several properties are a little confusingly named. The nearest phone is miles away and there are certainly no car chases, which probably reflects the lack of personal transport in 1919 quite realistically. This book is not the confident work of a seasoned mystery writer but sheer enthusiasm and imagination make it a jolly read for anyone interested in early mystery stories. In many ways it is the story of a village, a man returned from war, and his attempts to rediscover his peacetime role. Apparently there are over sixty books in the series to come and I assume that Ludovic will take over the detecting as the character of Wrentham is not really strong enough to carry a series of tough assignments. (A quick check on the later books suggests that this is very much the case). Altogether the republishing of these books seems to promise a feast of challenging reads and enjoyable mysteries to come from an engaging writer. There are so many modern crime novels set immediately after the First World War and during the twenties that it would be interesting to read something similar actually from that period. Even though it isn’t perhaps the greatest of writing I still think I shall look out for this. This does sound interesting. Are they reprinting ALL of them?